The Global Water Summit is for those individuals who want to make a difference – to get involved, to join the debate and get things done. Whichever part of the industry you’re in, you’ll find you’re in the right place to meet more key water leaders than you ever thought possible. We offer a generous 50% discount for not-for-profit institutions. Please email asmith@globalwaterintel.com to apply. We offer a ‘5 for 4’ discount for group bookings. Full details for each delegate are required and payment can be made online for the whole party by credit card. No refunds will be allowed after 25th March 2017 and all refunds are subject to a £100/$175 administration fee. Substitution of registrants may be made at any time up to the start of the conference. 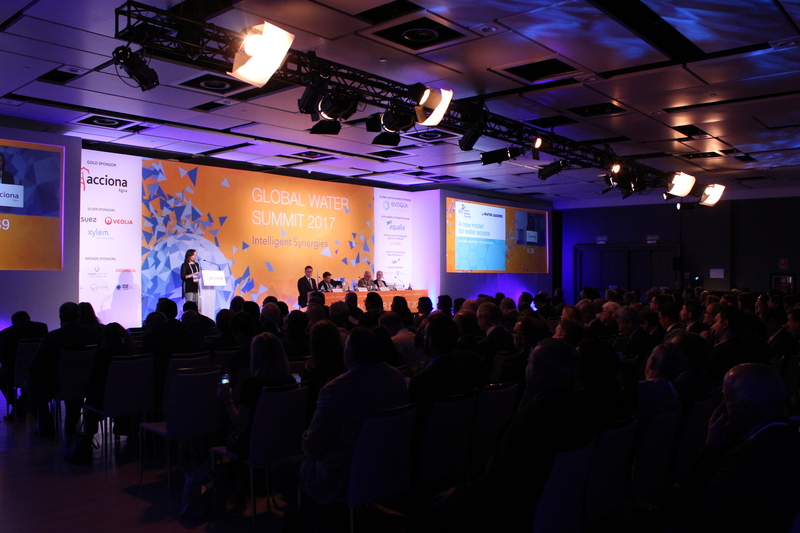 This conference is organised by Global Water Intelligence (GWI) which reserves the right to limit or deny access to the conference to any entity or individual. The agenda is subject to change at the organiser’s discretion. If you are not completely satisfied with our conference please notify us in writing within 15 days of the conference and we will refund 100% of your registration fee. Keith Minich, Third Bay Ltd. The following terms and conditions apply to users of www.watermeetsmoney.com – hereafter, Website. The Website is the property of Media Analytics Ltd, a limited company registered in the United Kingdom. The Website url www.watermeetsmoney.com is also registered to, and the property of, Media Analytics Ltd – hereafter, Media Analytics. ‘User’ of the Website means a person supplying information about themselves or others, whether paying for a delegate place or not. By registering for the Website and/or entering the Website by whatever route of access, you are deemed to have accepted the terms and conditions currently prevailing. Media Analytics reserves the right to change these terms and conditions at any time within this page. Continued usage of the Website subsequent to a change in the terms and conditions constitutes acceptance of any new terms and conditions. Media Analytics reserves the right to make any changes to the running programme, speakers and sessions at any time. The information the user supplies on first registration shall be accurate and complete. Media Analytics accepts no responsibility for losses as a result of updated user information not being advised to the Events Team in a timely manner. Media Analytics takes privacy and data very seriously. It will never rent or sell contact details gained via this Website to any third party. The user will not disclose their log-in details to a non-registered person to allow them to gain access to Registered/Paid Delegate parts of the Website. All images on the Website, except where another copyright holder is specifically attributed or credited, remain the property of Media Analytics. Save for such material taken for strictly personal use, you may not download, store, disseminate, republish, reproduce or translate such images in whole or in part in any form without the prior written permission of a Director of Media Analytics, and including full source credit. Where another copyright holder is specifically attributed or credited you may not download, store, disseminate, republish, reproduce or translate such images in whole or in part in any form without the prior permission of the attributed or credited copyright holder. Media Analytics does not undertake to supply contact details of any attributed or credit copyright holder. The Website is provided on an ‘as is’ basis and Media Analytics gives no warranty that the Website will be accessible by any particular browser, operating system or device. Media Analytics gives no warranty as to the accuracy or reliability of any information available on the Website and accepts no liability for any losses, damages and costs incurred as a consequence of relying on such materials. Media Analytics gives no guarantee of the accuracy or reliability of any material contained in the agenda section of the Website and accepts no liability for any losses, damages and costs incurred as a consequence of relying on materials published in such sections. Any email services supplied via the Website are subject to these terms and conditions. The user will not knowingly transmit any virus or other harmful matter to the Website. Media Analytics makes every effort to ensure the Website is free from contaminating matter but accepts no liability for any damages, losses or costs resulting from damage to the subscriber’s computer resulting from access to the Website. Media Analytics accepts no liability for any damages, losses or costs incurred as a result of access to the Website being interrupted or the Website being modified or discontinued. The Website contains advertisements and promotional links to websites and other resources operated by third parties. While we would never knowingly link to a site which we believed to be trading in bad faith, Media Analytics accepts no liability for any damages, losses or costs incurred as a result of access to such websites and resources, and it takes no responsibility for the content, privacy practices, goods or services offered by these websites and resources. Any transaction effected with such a third party contacted via the Website is subject to the terms and conditions imposed by the third party involved and Media Analytics accepts no responsibility or liability resulting from such transactions. Media Analytics accepts no liability for any damages, losses or costs incurred for damage to a Website user’s computer resulting from downloading material from website. Media Analytics accepts no liability for any damages, losses or costs incurred for unauthorised access or alterations of transmissions or data by third parties as consequence of a visit to the Website. While content on the Website is currently provided free to users, Media Analytics reserves the right to impose a charge for access to some or all areas of the Website without notice. In the event that Media Analytics considers that these terms and conditions have been breached, legal action may be taken to obtain appropriate compensation. These terms and conditions do not affect your Statutory Rights under UK law. If you have any questions about the terms and conditions of use described here please address them to cp@globalwaterintel.com.